Rhoeo spathacea or ‘ Moses in a Cradle’ and Rhoeo discolor compacta are two of the species for sale, both are a low growing clump forming foliage plant grown widely in tropical and sub tropical areas as a ground cover plant. Drought tolerant once established Rhoeo do not like frost prone positions. 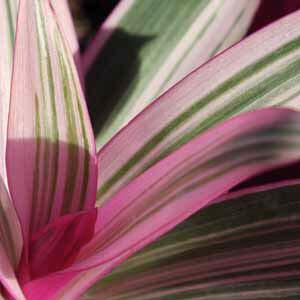 In full sun to semi shade these colourful foliage plants are an excellent addition to the garden. Rhoeo do flower, however the flowers are small and are held well down in the foliage and are often overlooked completely. Rhoeo are drought tolerant once established. Small flowers (insignificant) Rhoeo are grown for the foliage, a great purple underside and a nice texture make them a standout. 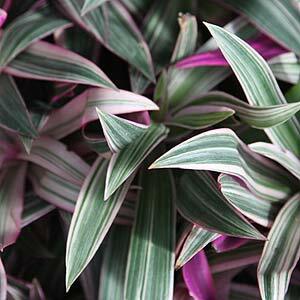 Dwarf cultivars such as Hawaiian Dwarf and Dwarf Variegated Rhoeo are also available. Cultivars such as ‘Stripe Me Pink’ (pictured lower right) are available from good nurseries. Propagation from offsets or ‘side shoots’ is easy, simply break away and replant. The common name does vary a little, ‘Oyster Plant’ is one, however Rhoeo are more commonly called ‘Mosses in a Cradle’ or ‘Moses in a Basket’. With good drainage and warm conditions these are generally a problem free plant, over watering is the main cause of problems. The soil of potting mix needs to dry between watering to prevent fungal problems. Healthy, 100% Organic garden plants. Buy online, direct from grower. 100% satisfaction guarantee. Flat-rate postage QLD NSW VIC ACT SA & NT. Huge range of tropical & rare plants, fruit & edibles, trees, flowers, foliage & more.